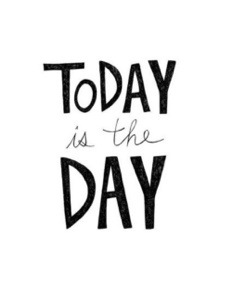 I woke up this morning, and said to myself, Today is the Day!! It is the day I get back to this journey of losing weight and taking care of myself. It was only one day, and it was challenging, and busy, but I did it. I did cardio and strength training, and I even stayed in my calorie count after going to the most unhealthy restaurant in my town. Actually, it’s a local restaurant that has the best burgers in the world, and delicious steak fries. They have a “dinner menu” with entrees, but I have never gotten one of them. Tonight I got the chicken breast dinner with a baked potato, green beans, salad, and a roll. Delicious. And less calories than one of their burgers. I did our meal plan for the week, and also grocery shopped. I *almost* put it off until tomorrow, but changed my mind at the last minute. I am SO glad it is over. I am excited to try two new recipes this week. One is pulled pork, and one is a cheesy chicken. They are both made in the crock pot. This week I am going to see P!nk with my girlfriends, and I am so excited. I even took a day off work, so I have a 4 day work week. Woot woot!!! Right now I am on my couch catching up with my google reader, and watching the third episode of “Scandal,” the tv show. Does anybody watch that show?? It’s awesome and intense. Looking forward to a relaxing evening. I am hoping to stay awake until 10! This entry was posted in Family, Weight, weight loss and tagged baked potato, cheesy chicken, chicken breast, girlfriends, green beans, grocery store, journey, P!nk, pulled pork, restaurant, salad, weight loss. Bookmark the permalink. I love Scandal and have been dying to find someone to talk about it with!!!! I only got to watch season 1. Is it in season 2? It is so hard! I really don’t drink much. Sweets are my major weakness. Yummmmmy. Thanks for commenting. Love ya!